We strive to provide the best personal experience for your special occasion. The price will vary depending on your exact requirements and locations. From £75 we offer carriage driving experience days from our base in Brentwood. These can include picnics and restaurant visits or full, hands-on carriage driving instruction where you take the reins. From £400 we offer ride-on horses for brides and grooms to arrive at their event in style. We will decorate the horses with flowers and/or drapes to suit the occasion, be it an English country church or full blown Asian extravaganza. 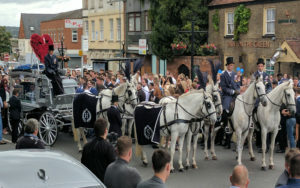 From £600 we offer a choice of carriage and a pair of horses, black or white. We will decorate the carriage and horses with flowers and/or drapes to suit the occasion, in a colour scheme of your choice. 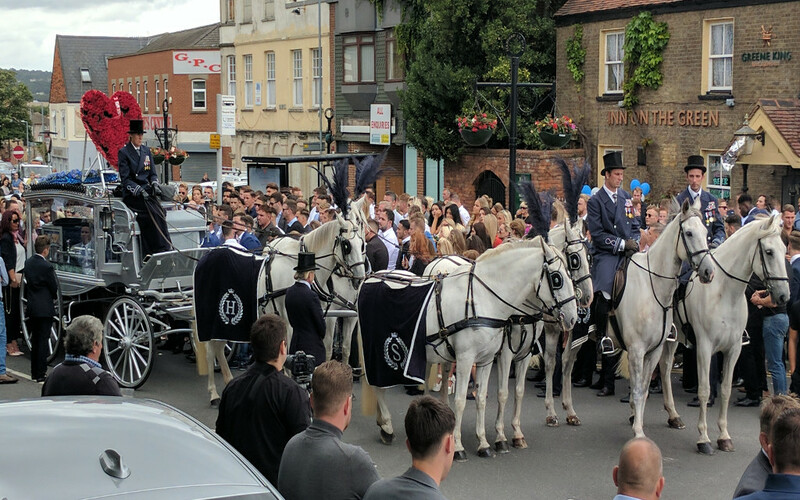 From £800 we offer a choice of carriage and either a unicorn (three) or a team (four) of horses, black or white. We will decorate the carriage and horses with flowers and/or drapes to suit the occasion, in a colour scheme of your choice. Please note that location does add to the cost. For example, a choice of carriage and a pair of horses in Central London is available from £800. How far and fast can we travel? We normally allow for six to eight miles per hour depending on the flatness of the terrain. Use 10 minutes per mile for a safe calculation. The limit for the horses is approximately 12 miles but they will need a minimum of 30 minutes break in the middle. We will examine the locations you require and will advise you on the practical, most scenic route to suit the horses and ensure you gain the best experience. Our Landau and Glass carriages are fully enclosed with glass or fully convertible in minutes. The Cinderella carriage is fully exposed to the elements and if it rains or is windy, you will get wet and/or cold. If wind, rain or snow is forecast on the day of your event we will keep a constant eye on the forecast and keep in touch with you. We will do everything we can to provide the requested carriage but reserve the option to swap carriages if necessary. Arriving cold and wet to your special occasion is not the experience we want to provide you! Can we ride upfront with the driver? For our carriage driving experiences you not only get to ride up the front, but you will also get to take the reins. For other events it may be possible but it will be at the absolute discretion of the driver. Can we decorate the carriage and horses? Horse drapes supplied by Carlton Carriages. Flowers supplied by customer. We welcome any decoration you wish to add to the carriage or horses so long as it does not impede the operation of the vehicle or materially affect the carriage. With notice, we can provide drapes for the horses, bunting and flowers all matched to your colour scheme. We have in the past entertained radical ideas such as re-painting the carriage a specific colour; Subsequently we managed to source an appropriate carriage without having to incur the additional expense. Please feel free to ask; we are happy to accommodate requests. What colour schemes can we choose? We pride ourselves on providing a personal service. With notice, we can match the horses feathers to your colour scheme. 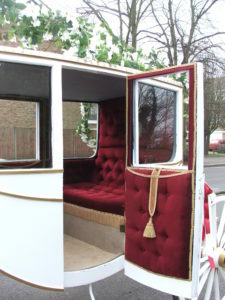 We will decorate the carriage with matching flowers, drapes and ribbons to coordinate with your designs. How many people can the carriage carry? All our carriages can carry four adults, two facing forward and two facing aft. The space is equivalent to the backseat of a medium sized car. ​​We have ​full public liability insurance cover of £5,000,000.